A Frenectomy also known as a Frenotomy or Frenulectomy, is a surgery to correct problems in an infant or child’s developing mouth tissue. The conditions leading to a frenectomy are usually caused by congenital defects that can impact eating, breathing, and speech. If not corrected, they can cause other issues later in life. Since the mouth is an integral part of the digestive system, sinus, and speech, these issues should not be minimized or ignored. The word frenum refers to the muscular attachment between two tissues. The most common problem areas in the mouth have to do with the tongue and the lip. It is estimated at 3-5% of the population has some form of frenum restriction and is often referred to as being tongue-tied. Parents should consult with a pediatrician to determine if their children would benefit from a frenectomy. 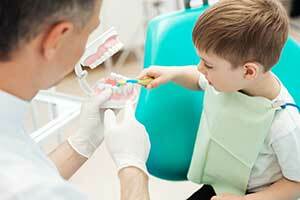 Usually, pediatricians will be able to spot defects that could require a frenectomy to repair. Sometimes the problems surface during breastfeeding. Unfortunately, some of these defects go unnoticed until children are older and begin to have problems speaking, chewing, digesting and complaining of discomfort. Parents should relate any apparent difficulties they observe to their pediatrician to determine if the procedure might be needed. A frenectomy is a surgical incision in order to separate the frenums that may restrict movement inside the mouth. Occasionally, it involves only minor incisions. In some cases, several different corrections may be made at the same time. It is usually best for these surgeries to be done after a child’s baby teeth have come out unless there is severe pain involved. The surgery can also be done on infants. The surgery usually does result in some scar tissue. This is why its best performed before or after the “baby teeth years”. A topical gel is usually applied for a frenectomy and local anesthetic may also be injected if needed. The incisions are generally very small and cause very little blood. Usually, laser treatments are utilized to cause precise and virtually bloodless operations. It is common to see some bloody saliva or spit ups as well as drool for a few days as the child or infant recovers from the surgery. Normally, over-the-counter painkillers such as Tylenol are all that is required to alleviate the pain. Since the mouth heals so quickly, the incision site has a tendency to re-attach. Some simple exercises can be performed to help minimize the possibility of the tissue healing up and re-attaching. A physician can give the details of how best to exercise depending on the nature of the surgery. The exercises are low-intensity and can even be performed on infants. While the thought of surgeries on an infant or young child can be daunting, the problems caused by frenum defects far outweigh the minor discomfort of this minimal surgery. Pediatricians can help parents decide how best to approach the situation on a case by case basis. Like many corrective dental procedures, the long-term results are worthwhile and can lead to better long-term health into adulthood.